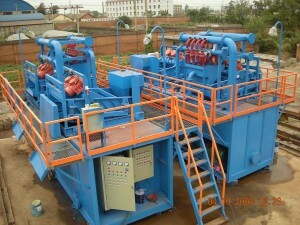 bentonite and mud preparing and cleaning equipments to the civil and international engineering and drilling industries. We have worked on hundreds of pipejacking and micro-tunnelling projects through many different types of ground. tunnelling, pipe-jacking, micro tunnelling, caisson sinking, horizontal directional drilling, off-shore & on-shore oil & gas exploration & production,oilfield waste slurrification & reinjection into deep strata, canal & dock cleaning, soil washing, site investigations, quarrying, minerals recovery and general construction. Both big system of horizontal Directional drilling mud recyle equipment and small mud recyle equipments are available from GN Solids Control. The main Equipments including:Mud Cleaner, Shale Shaker, desander, desilter, decanter centrifuge. Welcome to contact us for choosing The best drilling mud equipments,horizontal directional Drilling mud recycle equipments and system. we have plan to build mud tank on our accommodation work barge, that cap. min 500m3 , tank will put on the bottom tank / ballast, [please advise wich tank wich tank recomend and give as the detail drawing .